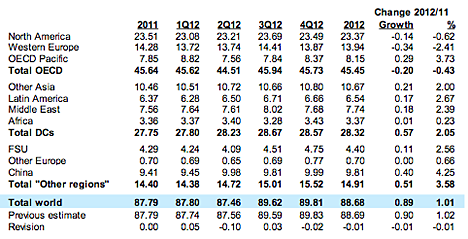 Non-OPEC supply is forecast to increase by 0.7 mb/d in 2012, supported by the anticipated growth from North America, Latin America, and FSU. 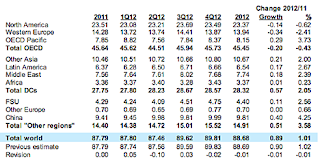 In 2013, non-OPEC oil supply is expected to grow by 0.9 mb/d. The US, Canada, Brazil, Kazakhstan, and Colombia are expected to be the main contributors to supply growth, while Norway, Mexico, and the UK are seen experiencing the largest declines. 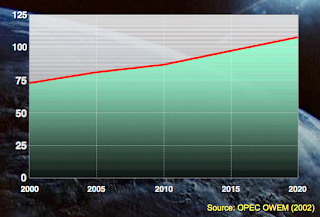 OPEC NGLs and non-conventional oils are seen averaging 5.9 mb/d in 2013, indicating an increase of 0.2 mb/d over this year. Overall OPEC sees demand staying below 90 mbd over the remainder of this year, with total growth in demand lying at 1.01 mbd. Much has happened since the late Matt Simmons and Nansen Saleri got together to debate scenario’s for future oil production in Washington, back in February, 2004. While Matt had developed his research that then led into the publication of “Twilight in the Desert”, this was the meeting where Aramco pushed back to explain that there would not be a global problem, for at least fifty years. As this series of posts on Saudi Arabia comes to a conclusion, and moves on to other countries, it is perhaps of some value to look back on the presentation by Mahmoud Abdul Baqi and Hansen Saleri to remember what was said. Back in those days oil demand was expected to steadily rise, with increasing rate, to reach 100 mbd in 2015. At the time Aramco had no concern over the industry being able to meet this increase in demand, and fully expected that Aramco itself would be able to more than sustain its share of the increased demand. They had 9 seismic crews out surveying the country, and some 48 rigs drilling both to sustain their then current level of production, and also to explore for new resources. At the time Aramco reported that with 700 billion barrels of oil initially in place, that had been already discovered in the country, they expected to find another 200 billion barrels. Of that discovered oil they considered 260 billion barrels as their reserve, of which, by 2004, they had 131 billion barrels in development. 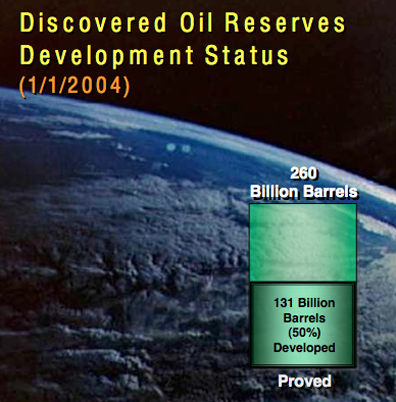 (Note that they defined the reserve as the total amount of extractable oil, not the amount left to recover, they have done that in later computations also, and the latest annual report uses 259.7 billion barrels as that discovered reserve). 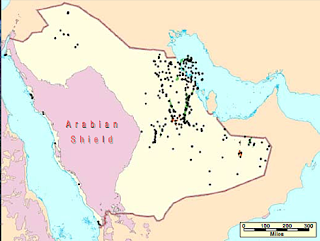 The Annual Report notes that they discovered one new field in 2011, the Wedyan-1 well in the Empty Quarter flowed at 2.3 kbd from the Mishraf reservoir, while they drilled 161 exploration and development wells. For a short arithmetic problem consider that 260 less 131 equals 129, and it one adds another 21, as a percentage of the 200 billion barrels to be found, then one gets 150 billion barrels. 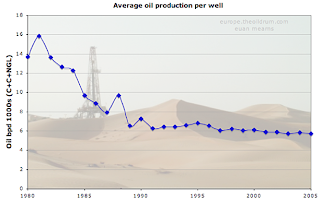 Divide this by 3 billion barrels a year of rough annual production and you get the 50 years of remaining life, that Saudi Arabia considered, back then, that their oilfields have left. This should be read in conjunction with the state of depletion of the different reservoirs in the KSA, as reported for 2004. And remember that this was eight years ago, so there has been that much change in the numbers! 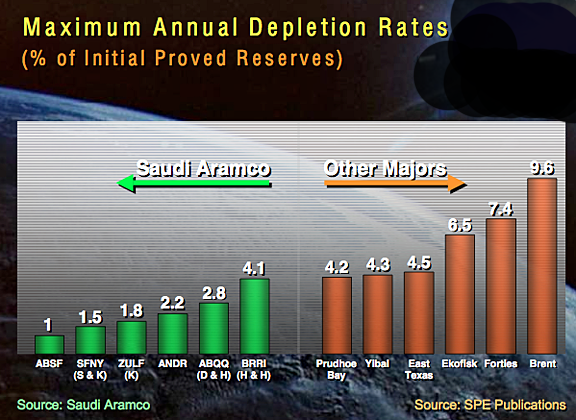 Aramco also expects to recover about 75% of the Original Oil in Place (OOIP) in all fields. They have been able to reach around that level with Abqaiq, which also suggests that the days of that field are now very numbered. 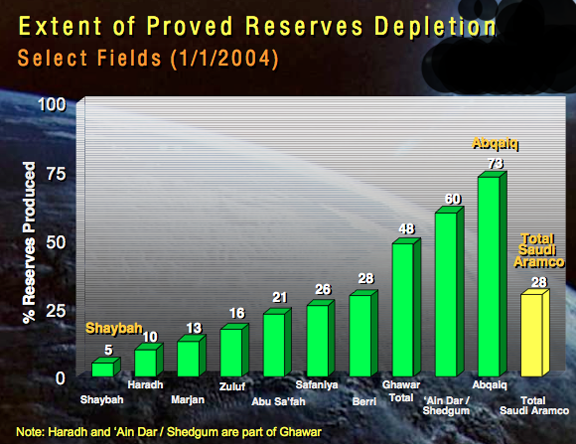 But whether this will be possible in the other reservoirs is more open to doubt, and if there is less recoverable oil, then the actual depletion rates go higher. But where the field is just starting, such as the new development of Haradh, if they hold the extraction rate to 1.7% of the anticipated total recovery then they anticipate that the field will continue to yield 300 kbd for decades. 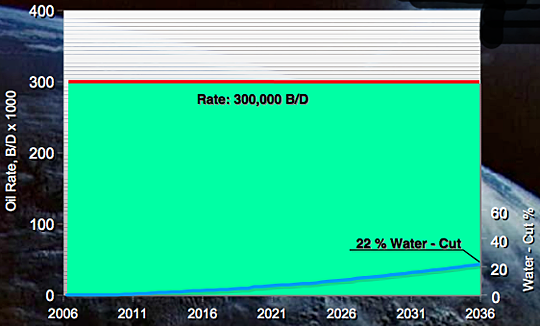 It was this anticipation of success across their endeavours that led the company to project that they would be able to hold a Maximum Sustainable Capacity of 10 mbd until 2042, with it only then becoming necessary to replace reserves from the probable and possible fields yet to be found and developed). The last few posts have described how, as declining output has now hit the original fields, Aramco has moved to add production from other fields (Shaybah for example will soon be producing at up to 1 mbd) and is introducing multiphase pumps to Haradh and Shaybah to improve production from marginal wells, and in Safaniya to sustain a maximum production capacity of 1.3 mbd. Production from Manifa is also anticipated to step in to cover declines in other fields, and come on line in 2014, with a capacity of 900 kbd. But these new additions are required to offset the decline in existing fields, which have been somewhat protected from the severity of declining well production by the switch from vertical to maximum reservoir contact (MRC) wells. Although this conceals the depletion of the oil in the reservoir during normal production it does not, by itself, improve the ultimate production from the field, but rather can shorten field life, since these wells have proved to be more productive in rate. Nansen Saleri now appears to duck questions which ask if KSA can increase production beyond 10 mbd. Within The Oil Drum (TOD) there has been considerable discussion over the rate at which well production declines, and the remaining reserve in the field depletes. 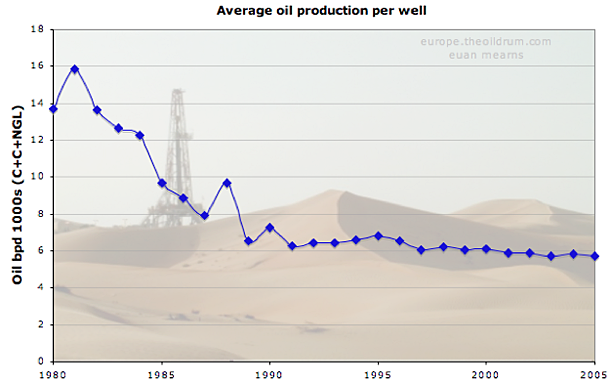 One impact of the shift in wells from old established fields is that production from the average well will decline over time, a subject that Euan has visited in the past. It should be noted that the use of the submersible pumps are reported to have brought wells back to around 3,000 bd. But the move over to horizontal and MRC wells has slowed the impact of other changes in the country. Nevertheless, after putting all this together, I re-iterate my conclusion from last time in that I doubt that KSA will increase production much above 10 mbd, (in June it was producing 9.888 or 10.103 mbd depending on source, and with the rising internal demands (domestic use in the Middle East is now projected to average 7.7 mbd in 2012) world markets will get tighter in the shorter, rather than the longer term.